Best “all purpose” liquid wash. Upon use, it produces many slippery, creamy bubbles. Contains cocamidopropyl betaine which is thought to have antiseptic properties. Formulated to also be used as hand soap and shower gel. Best “all purpose” liquid wash. Upon use, it produces many slippery, creamy bubbles. Contains cocamidopropyl betaine which is thought to have antiseptic properties. Formulated to also be used as hand soap and bubble bath. Warnings: Do not ingest. For external use only. Keep out of eyes. Water, Sodium Laureth Sulfate, Sodium Lauryl Sulfate, Cocamide MEA, Cocamidopropyl Betaine, Methylparaben, Methylchoroisothiazolinone, Sodium Chloride, Methylisothiazolinone, Citric Acid. Water, Sodium Laureth Sulfate, Sodium Lauryl Sulfate, Cocamide MEA, Cocamidopropyl Betaine, Methylparaben, Methylchoroisothiazolinone,Sodium Chloride, Methylisothiazolinone, Citric Acid. Heat base to 110º F, making it easy to pour into bottles. Do not overheat. Mix cosmetic dye, amount as desired. Bubbles must remain white or staining may occur. Maximum fragrance is 1% as long as the 1% is within IFRA guidelines. Some fragrances may thin product. 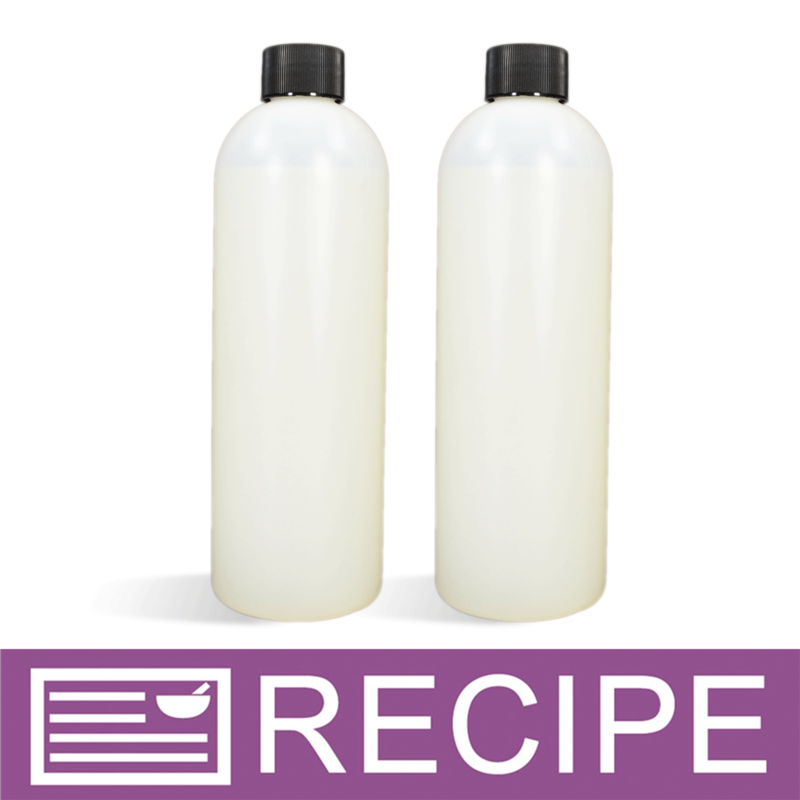 The Crafter’s Choice Bubble Wash Thickener is recommended to increase product thickness. COMMENTS: Love this bubble this bubble bath. Creates soft, lush bubbles. Very easy to add fragrance and color. COMMENTS: Produces a wonderful lather and is easy to work with. COMMENTS: When I say I was hesitant, that is just because I had never used anything like this before. The ease of use, amazing! Great creamy bubbles! I use this in my frosting for my bath fizzies and it turned out wonderful. It is also great in bubble scoops and creates a nice creamy bubble and lather when added into other products of mine that I make. COMMENTS: Very versatile product. I use this for body wash, shower gel, liquid hand soap and bubble bath. Easy to work with...accepts scents and liquid color well. COMMENTS: I recently bought this to use for bubble bath. The only thing I did to this was add a Fragrance Oil, Pearlizer, and some Mica colorant. Tried it this morning in my bath, the bubble were over my head and I only used a small amount!!! To even be able to get in the tub, I had to "knock down" the bubbles and they lasted for about 30 minutes. And I had read some reviews that the mica wouldn't stay suspended, but mine seems to be doing just fine and looks really pretty in it. COMMENTS: So many compliments! A LOT OF BUBBLES! COMMENTS: this stuff is great! cheaper then making it my self too! COMMENTS: This is an excellent bubble bath that holds scent and colorants well while producing a lot of bubbles! The only drawback is that the mica does not float in this base. COMMENTS: I love this bubble bath. It has tons of bubbles and it's so easy to use. Would highly recommend! "So easy to work with"
COMMENTS: My grandsons love this bubble bath...lots of bubbles. "Its okay, has a strong natural scent though "
COMMENTS: Nice bubbles and great lather, but I am not a fan of the smell. It's hard to mask for me at times. "Great bubbles that last a long time!" COMMENTS: Takes color and fragrance well! COMMENTS: This is my all around go-to bubble bath. Most of my customers love it and it easily accepts color and fragrance. I will keep purchasing it as long as they sell it. COMMENTS: This product is nice and thick but not too thick where you can’t use it. It takes fragrance oil and WSP pearlizer well and has a good amount of bubbles when used. I will reorder for sure! COMMENTS: I got this to use for bubble bath because so many requested it. I love all the bubbles. COMMENTS: I use this with the bubble up and I get very nice bubbles. It is a very thick base on its own but it is a good product. COMMENTS: This stuff is crystal clear and bubbles very well. It takes color well with a few drops of the stained glass liquid dye that I purchase from WSP. COMMENTS: can't get enough praise for this bubble bath! COMMENTS: It foams up really well and it takes to fragrance well. COMMENTS: My five year old loves this bubble bath. It's a favorite with our customers too. The bubbles are long lasting and simply amazing. Best bubble bath base ever. "Crafters Choice - Bubble Bath - Clear"
COMMENTS: What can I say, well this is amazing. Makes it so easy to create your own Beard Wash, Bubble Bath, etc... It has many uses even when you are adding other products with it. Be careful though, do not add Bubble Up to this product, it will turn to a hard jelly. Besides you do not need to add this, it makes tons of bubbles. My male clients love it, when I make their Beard & Stache Wash. COMMENTS: I love the bubbles that it makes..!! Pure fun to play with..!! COMMENTS: We purchased this product after testing out the vanilla verbena bubble bath kit, due to receiving great feedback from our clients. We absolutely love working with it because it is so easy do use, and it produces a wonderful finished product. "Perfect for my bubble bath recipe!" COMMENTS: You can't go wrong with this nice base for your bubble bath recipes. Easy to use and mixes well with other add-ins for lots of bubbles. Mixes well with fragrances, too. COMMENTS: Great as a hand soap and bubble bath. Thick and incorporates ingredients very well. "Kids will live the big fat bubbles!" COMMENTS: Great bath product. Lots of bubbles that lasts and last! I added a foam booster and even more bubbles. Great to use as a bubbling salt product for the grown ups! COMMENTS: Needed a thick soap for sample bottles... was perfect! COMMENTS: I was hesitant to order this Bubble Bath as I usually buy the Liquid Suspension Soap base in the 5 gallon bucket. Boy am I glad that I did! I have found that it is best to warm up the liquid for 30 seconds, then mix in fragrance/colorants. I have also added a touch of iridescent glitter. WOW! Super thick and bubbly when added to water. Thank you WSP! COMMENTS: This makes the best bubbles! COMMENTS: I use this for multiple products (hand soap, shower gel and bubble bath) it is great when you can buy one product with multiple uses! I definitely recommend this product. COMMENTS: Perfect for bubble baths. TONS of bubbles and super thick liquid. COMMENTS: Used for wedding shower favors scented with Margarita FO, bubble pearlizer, lightly colored green in keuka bottles with tied with gold and green curled ribbons around top of bottle with gold foil covering top of bottle! COMMENTS: This is absolutely my favorite bubble bath to use and the price is fantastic. I've used this for over a year now, and I always keep coming back for more. It has a great lather and bubble size, especially when you combine it with the bubble up. I usually buy this in the gallon sizes and I go through them so quickly. They hold fragrance and color wonderfully as well. Highly recommend! COMMENTS: I actually bought this product by mistake and wasn't sure what to do with it, but it's bubble bath so how hard can it be? I went with it and it was easy to use and provided lots of great bubbles. COMMENTS: Awesome high quality bath with lots of bubbles. COMMENTS: This is the best bubble bath ever! It creates huge fluffy bubbles that last for a long time! One of my best selling products! COMMENTS: This is a great base that can be used for anything liquid. Love it. COMMENTS: This is awesome stuff people! Makes great bubble bath and bath gel. Takes EOs beautifully with NO cloudiness! Woot woot! Definite a crowd pleaser. COMMENTS: I used the recipe on this site with a little modification. It's a very thick product and a little goes a long way. I had bubbles climbing out of my jetted tub and on to the floor. But I had a very happy kid. COMMENTS: Nice thickness, great price! very easy to mix and make as well. Thanks WSP! COMMENTS: This base holds scent well and when you add other things to it they also hold nicely!!! The bubble is wonderful!! COMMENTS: I buy these primarily for our own use but let me say its the best bubble bath I have ever bought! The great thing is my kids can pick their own fragrance and color, they love that. COMMENTS: This stuff is so rich and sudsing action is amazing. It leaves your skin like silk. We have been buying the 4-5 pound packs of this at a time and still running out very fast. Toss in a little color and scent of choice and off you go. Amazing stuff. We can barely keep it in our home for ourselves, we are so busy making it to sell. COMMENTS: Great Bubble Bath base for the price. Accepts color and scent well. Mixes easily. COMMENTS: Tons of bubbles. Love this stuff. COMMENTS: This is great bubble bath. Fragrance will thin it out a bit, and be careful how much fragrance you add (follow the guidelines WSP puts on their fragrance listing. It holds fragrance wonderfully. Lots of bubbles. Will definitely look into selling this to customers, but for now we bought a gallon for our home. LOVE IT. COMMENTS: Easy to use bubble bath base. Accepts fragrances & color well! COMMENTS: My first time buying a bubble bath base, Really nice the customers and my son love it! Produces nice bubbles and takes fragrance/color really well! "Very good quality bubble bath base!" COMMENTS: A little bit goes a long way!!! I tested this before I even put color and fragrance. I will purchase some more! COMMENTS: I love this product I have added many different ingredients to this base and it takes everything from Lathanol to bubble up to aloe Vera beautifully. My favorite recipe is to add 5% Lathanol .5% essential oils another 2% aloe Vera gel and a little mica for color. It is the most amazing bubble bath I have ever used. Thanks WSP for another great product. COMMENTS: This is a great base for bubble bath. Makes tons of bubbles. COMMENTS: The Bubble Bath base is AMAZING!!! I've always been using the other shower gel base, and for bubble bath I would mix in a little mica to make it frosty. But since I stopped selling shower gels, but was still getting requests for bubble bath, I tried this base out. It makes the fluffiest lather I've ever seen! Total fill-the-tub-with-fluff bubbles! And the best thing was the suspension...the mica doesn't settle to the bottom! It stays throughout the bottle and is shimmery rather then frosty...so beautiful! This product is definitely on my reorder list! "Good general use Bubble Bath"
COMMENTS: Works well, fragrance incorporates well as does colorant. Doesn't thin with fragrance. Versatile product! "Doesn't thin out too much!" COMMENTS: I had tried a competitors product but found that it thinned out to near water constancy after adding FO. I decided to give Crafter's Choice a chance and was so glad I did! It not only stayed nice and thick but gave me lots of long lasting bubbles too! Thanks again Crafter's Choice! COMMENTS: This product makes lovely bubble bath. I think it is my new go to product for bubble bath. COMMENTS: Very nice thick bubble bath. Very easy to work with. Just a quick burst in the microwave to thin it a tad and add in's blended right in and poured into bottles no problems. I will be purchasing more of this. COMMENTS: Very easy to make. Great product. "great product, thins out a bit sometimes." COMMENTS: for the most part this is an excellent product at an excellent price. I use it for both my bubble bath and shower gels products because it seems to be a bit thicker than the crystal clear shower gel which tends to thin out a LOT when adding any fragrance. overall i would purchase this product again. COMMENTS: Great bubbles,,,needs Bubble Up and Bubble Thickner just in case one uses some FOs that tend to seriouslt thin out product. They are both excellent and affordable additional products to keep on hand when formulating. COMMENTS: I just tried this with the various wine fragrances in the kenuka bottles for a wine shop opening. a good product that stays clear and holds scent and color well. might need thickener if you add too much scent. COMMENTS: This product is great for a relaxing bath. It produces more bubbles than most other bubble bath products I've bought in stores. I recommend this product. "Makes a wonderful bubble bath"
COMMENTS: This really makes a lot of nice bubbles for a great bubble bath. I use the bubble wash thickener to keep it nice and thick after adding the FO. That works well. I just started selling this product and customers are giving it great reviews.....and buying more. It also looks so pretty in the bottle. I expect to buy a lot more. COMMENTS: At first I only used this base for bubble bath, and since then I've began using it for body washes as well. It is a great multi-use base and holds fragrance and color well while producing a bubbly lather. "All I can say is "WOW"." COMMENTS: I just got this product and tried a bit in my bath this morning. The volume of bubbles was fantastic and they lasted forever. Very concentrated in my book. Thick and took color well. I added a small amount of booster and pearlizer but I'm not sure it needed it. Looks great in the keuka bottles. I'm glad to know my customers will get their money's worth in this product. COMMENTS: This stuff is awesome. You only need a little to get A LOT of bubbles. My best baths ever were taken with this bubble bath. The liquid took very nicely to fragrance. COMMENTS: I have bought this more than once and just love it. It makes lots of bubble. You won't be disappointed with this. COMMENTS: Wonderful bubbles and makes beautiful soaps when mixed with a small amount of mica shimmer powder colored and fragrance. A definate keeper in my product line! COMMENTS: Scented this with bubble gum and my 3 year old loved it! Great bubbles! COMMENTS: Needed a base for bridal shower favors and this fit the bill perfectly! Easy to mix and use, and creates mounds of bubbles. Awesome base! "Do not use unscented (it has a bad smell)." COMMENTS: I use this bubble bath to make bath gel and it is FABULOUS!! It doesn't take much to make lots of suds. It holds fragrance well. I will continue purchasing this product! COMMENTS: I absolutely love this Bubble Bath. Its so easy to use and I think this will make a very nice product to bring to my customers. I am using it right now to fill small bottles for samples as I fill orders. I think something this nice will make a big hit on receiving samples. The cost is minimal and I know I can send samples out without breaking the bank. Thanks so much for the reasonable prices!! I will order this item again and again. COMMENTS: Simply fantastic bubbles! It does have a scent of its own, but once you add your fragrance or essential oils you can not smell the base. Wonderful Product! "Nice product will buy again." COMMENTS: Wow, this is such a clear bubble bath, its not milky and looks great in bottles, it takes color and fragrance really well, I would recommend adding fragrance, as this does not have the greatest scent all by itself, but once you add fragrance that goes away. It stays clear and does not go milky like a lot of bubble baths do. Great pricing at bulk rates as well, highly recommended. "Good Amount of Lasting Bubbles"
COMMENTS: After trying many other bubble bath products, this is the thickest with the best bubbles and staying power! My customers love it! I use it on a daily basis myself! COMMENTS: This stuff will kick your other bubble baths butts! As my brother said, this makes bubbles like you see in the movies - thick, clingy and abundant. Wonderful wonderful product and a little goes a long way. Super thick so we watered it down a bit. "Lots of Bubbles and Staying Power!" COMMENTS: I had previously been using the concentrate, but could not get the bubbles that I wanted. I added the pearlized foam booser but decided to try this product and Wala! My customers comment on how much they love it! I still add the foam booster, mostly for the pearl color it gives. Lots of staying power and bubbles. Highly recommend this product! COMMENTS: Great product, lots of bubbles with staying power. A little goes a long way! Extremely popular in childrens products! COMMENTS: This is a great bubble bath base with lots of bubbles & scents nicely in Bubblegum scent - kids love it! COMMENTS: This produced a ton of beautiful bubbles. Customers love it. COMMENTS: I have tested this on both me and my daughter who have super sensitive skin and are thrilled! Great product. COMMENTS: i love this product. it is the best bubble bath i have ever used. lots of thick bubbles. a little does go a long way. COMMENTS: Just a capful made plenty of bubbles. "Nice & Thick & Bubbly"
"What do a gallon and a 4 gallon weigh?" Staff Answer One gallon of this product weighs approximately 8.85 lb. A case of 4 is approximately 36 lbs. "can i add coco betaine to my shower gel due to thinness from fragrance oil? i know about the bubble thickener but i dont have the time to wait for shipping." Staff Answer Yes, you can add cocamidopropyl betaine to the bubble bath. "I only added FO and some of the bubble up and my bubbles did not last at all! Any solution "
Staff Answer Adding Bubble Up would help to add more bubbling agent to the soap base. Make sure your fragrance is being used within the IFRA guidelines. We aren't sure how long you would like the bubbles to last. Normally, they would last about 10-15 minutes or so. "Will this product discolor if I use a FO with vanillin?" Staff Answer Yes, it will. We recommend using the Vanilla Color Stabilizer for Lotions and Washes. "Is this safe to use for dogs like a shampoo bubble bath combo?? Would it irritate their skin if not rinsed off?" Staff Answer This product should be fine to use on dogs but you may want to test to be sure there is no irritation. We would also recommend rinsing the product off. "For a foamer bottle, should this be mixed 3/1 water /base or 3/1 base /water? Thank you"
Staff Answer The ratio for a foamer bottle is 3-4 parts water to 1 part base. "My bubble bath has always turned out great until now. The only thing different is I'm using the same measuring cup for my bubble up and fo. Would that matter? It's very cloudy and has been sitting for over a week with no improvement. Any ideas?" Staff Answer This can happen with certain fragrance oils. We recommend heating the base before adding the fragrance and, if that doesn't help, you may need to add some FO/EO Modifier to help clear it up. "Is this too thin for micas? Will it just sink? If so, anything I can do to change that?" Staff Answer Mica will sink in this product. You would need to use the Liquid Suspension Soap Base to keep the mica from settling to the bottom. 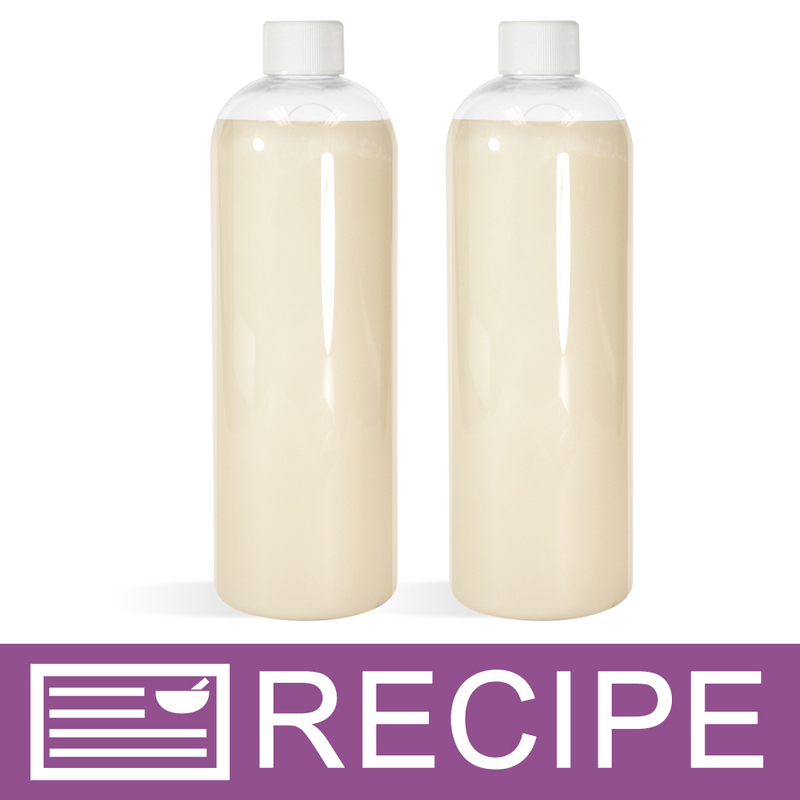 http://www.wholesalesuppliesplus.com/products/liquid-suspension-soap-base.aspx. "Can this be used in a melt and pour base?" Staff Answer We would not recommend this as it may cut down on the amount of lather in the MP soap. You might try adding Bubble Up, which is all coconut oil based. "Do I have to add any other product to this besides fragrance oil? Some recipes posted have quite a few other ingredients that don't seem necessary. I would assume it will bubble up all on its own?" Staff Answer You can absolutely use this base and just add fragrance and color is desired. We offer different recipes and options for customizing this base. Here is a link to further information: http://www.wholesalesuppliesplus.com/handmade101/learn-to-make-articles/learn-to-make-bubble-bath-base.aspx. "Can I use colourants that have been dispersed in glycerin with this Base?" Staff Answer Yes, you can use this type of colorant. "I have a pipable bubble frosting recipe that is calling for bubble up. Are the 2 similar enough to substitute with until my bubble up arrives or will that be a disaster waiting to happen?" Staff Answer Since the Bubble Bath has added ingredients in addition to the Cocamidopropyl Betaine, we cannot be sure how this would work in your recipe. "It seems like I'm having the opposite problem as others. When I added FO, the base thickened even more! What would be the best way to thin it out a little? " Staff Answer Every fragrance used needs to be tested in your product because, as you can see, they can react in a different way. You could try adding a small amount of bubble bath to thin. You could try a small amount of water, about 1%, to see if that will help. If adding too much water, you will need additional preservative. "Is this soap water base? I want to experiment with it in my bath bombs." Staff Answer Yes, the bubble bath is water-based. This may make your bath bombs fizz if used in your recipe. "Can I add some of this with water to a former bottle and if so do I then need to add a preservative? I have germall, how much of it would you recommend for an 8oz foamer bottle mixed with let's say two oz of this and 6 oz of water? " Staff Answer Yes you would need to add a preservative. The bubble bath should be mixed 3:1 with water. This preservative is used at 0.1-0.5% in this type of product. "What is the difference between the Bubble Bath and Shower Gel Base?	" Staff Answer They are both a liquid “all purpose” wash that can be used for bubble bath, shower gel and hand soap. They are marketed on our website so that customers can locate the product no matter if they search as bubble bath or shower gel. "Can this be used on the face?" Staff Answer This product is safe for the face but it is recommended to be used as a bubble bath rather than a facial product. "Can I interchange this Clear-Bubble Bath with Liquid Suspension Soap Base?" Staff Answer The two products do have some of the same properties but no, your final product will not be the same if you substitute bubble bath with our liquid suspension soap base. "I don't know if this is the same question as above where someone had separation, but after I bottled mine up, after about an hour a foam settled on the top... I thought maybe it was just doing its thing and would maybe just evaporate but it was still there about 5 hours later. Any thoughts? I used Caribbean Escape to fragrance it. I don't think I used too much. " Staff Answer Since it is a bubble bath it is susceptible to bubbles at the top of the bottle. After you pour the product into their containers air can get trapped inside and cause the bubbles that you see. Give it some time to sit still and settle, if it does not settle please give our customer service a call. "Can I add this to bath bombs to make them bubbly when added to the bath?" Staff Answer Hi Reina - We would not recommend this for bath bombs. This is a liquid product that might cause your bath bomb mixture to fizz prematurely. For more bubbles, you could use lathanol powder. To view this product, Click Here. "Hard water where I live. How does the bubble action perform in hard water? What enhances bubbles with this product in hard water?" "Does this contain any nut oils?" "When using various Fragrance Oils this base tends to thin out, I saw in previous WSP posts than Xanthum Gum could be used to thicken this back up. What percentage of Xanthum Gum should be used?" Staff Answer Some fragrance oils can thin a liquid soap base such as this one. Typical Use Levels for xanthan gum are 0.2-1.0%. "How much bubble wash thickener should I use to help thicken the bubble bath?" Staff Answer The usage rate stated in the "Learn To Use Directions" is 1-5% That would be the equivalent of 1-5 teaspoons per 16oz of Bubble Bath. Staff Answer No, this bubble bath is not tear free. "Is this product all natural?" Staff Answer No, this is not an all natural product. "Could I use this as a 3-in-1 Body Wash, Shampoo, and Conditioner?" Staff Answer We recommend this to be used as hand soap or bubble bath. Although you could certainly try using it as a 3-in-1 wash, it is not formulated to have the same benefits that a shampoo/conditioner would likely have. "what is the shelf life of this? i plan on selling it and need to know the expiration? does it need a preservative? i have germaben ii and if so how much? " WSP products have a shelf life of at least one year. This bubble bath base does not require a preservative. Just add your essential/fragrance oil and colorant and it is ready to use. "I have used FO in the past with this product and never had any trouble.Today though I added my FO and it became a bit thinner. Is there any way to thicken this up? Thanks"
"Every once in awhile I get a color/fragrance combination mixed with this product that causes it to separate and settle. Any ideas what is causing it?" Staff Answer Too much fragrance can causes separation. Bubble bath is a water based product. Fragrance is oil. The two will naturally want to separate. If this happens, try heating the base slightly and sometimes that causes the two to blend beautifully. I've found that some combinations need more mixing than others to get them to fully incorporate. And usually you don't find this out until after it's been bottled! If you're sure you haven't added too much fragrance and it's just not working for you, try mixing more - if you've already bottled it, shake well, let it sit to the "settled" point again, shake again if necessary, and repeat - I've found this works to fix the stubborn blends that have a noticeable separation. Regardless of why it is happening, it can be prevented by adding Polysorbate 20. It's takes the oil and makes it basically water (when it comes to mixing). So therefore, there is no oil to seperate and settle because it is all as one. Hope that answers your Q.